Computed Tomography is sometimes referred to as CT or CAT scan. CAT scans image anatomical information from a cross-sectional plane of the body, and create a 3D likeness that is much more detailed than a normal x-ray. 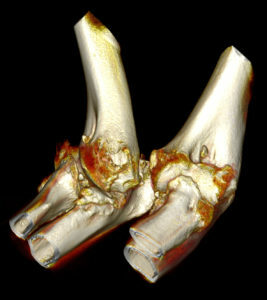 Both CT and conventional x-rays take pictures of internal body structures. In convention x-rays, however, the structures overlap. For example, the ribs overlay the lung and the heart. In an x-ray, structures of medical concern are often obscured by other organs or bones, making diagnosis difficult. 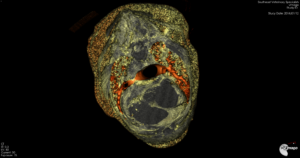 In a CT image, however, overlapping structures are eliminated, making the internal anatomy more apparent. Below are some images taken with our new Vimago volumetric imager. Notice the much enhanced appearance of the body structures compared to the previous x-ray. During CT imaging, an x-ray tube rotates around the patient so that multiple images are collected from many angles. These images are stored in a computer that analyzes them to create a new image with the overlying structures removed. 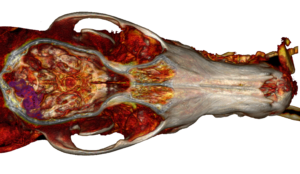 CT images allow veterinarians and diagnostic specialists to identify internal structures and see their shape, size, density and texture. This detailed information can be used to determine a medical problem, the extent and exact location of the problem, and other important details. The images can also show if no abnormality is present. A CT scan that shows no abnormality still provides useful data. The information aids the diagnostician by focusing attention away from unnecessary medical concerns. Modern CT scanners acquire this information in seconds–sometimes in fractions of a second–depending on the examination. The Vimago™ imaging platform employs HDVI™ technology, which produces incredibly detailed, 3D images of your pet’s anatomy. Vimago™ also has onboard Digital Radiography and Fluoroscopy; which allows us to create real-time, moving, x-ray images to help better enable diagnosis and aid us with surgical outcomes. HDVI™ (High-Definition Volumetric Imaging) is a new, proprietary and patented imaging technology that provides unprecedented diagnostic and interventional information for clinicians. HDVI™ data can provide resolution as small as 0.09mm (about the thickness of a human hair). Clinicians can see the data in any angle, thickness or orientation. The results are superior diagnostic confidence – and why HDVI™ is the new standard for primary imaging. Vimago™ Diagnostic Fluoroscopy may be used for: coughing, swallow studies, shunts, collapsing tracheas and more. Vimago™ Interventional Fluoroscopy may be used for: biopsies, endoscopy and more. No other type of imaging procedure combines these advantages into a single session. During a CT scan, your pet is briefly exposed to more radiation than they would be during a plain X-ray. This extra radiation carries a small potential for increased cancer risk. 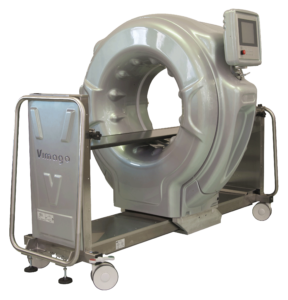 Vimago™ uses considerably less radiation than other CT devices, which decreases your pets radiation exposure time compared to other imaging techniques. With Vimago™, our veterinarians are using the lowest dose of radiation possible with each scan. In addition, they only employ the technology when they know it will benefit the patient. CT units and the equipment associated with them are very large and usually require a separate room for operation. 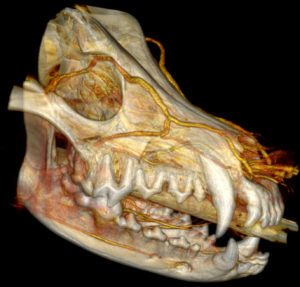 The Vimago™ High Definition Volumetric Imaging unit we have purchased has been produced specifically for imaging animals. Consequently, it requires less space than a human CT. During our renovation and addition we are establishing a special room for this unit. We are vey pleased to offer Vimago HDVI technology, as this state-of-the-art equipment is proving to be an invaluable tool for our doctors, and a significant life saving instrument for our patients.